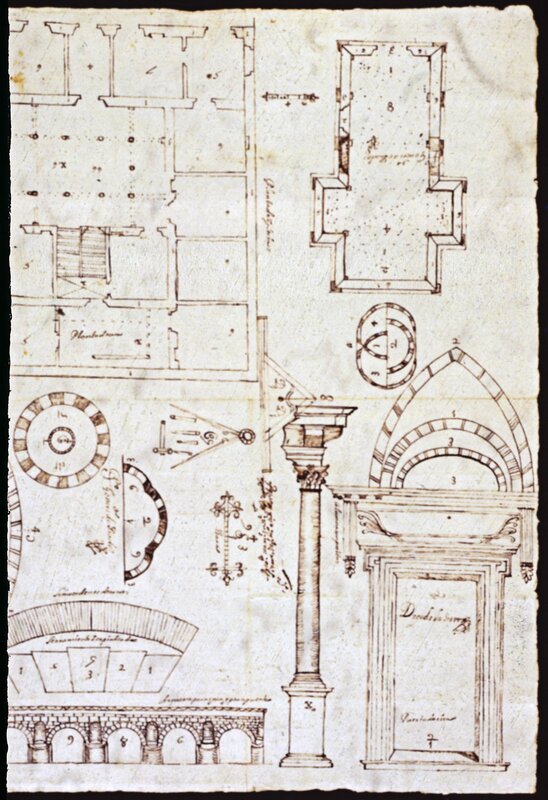 These drawings are part of the bid that Diego de la Sierra, then living in Puebla de los Angeles, made to become “maestro mayor,” or master architect, in New Spain. In them, he demonstrated his knowledge of the vocabulary of European architecture. To show his knowledge of building types, Sierra drew a plan for a house of ten rooms. Next to it is cross-plan church. Next to the “composite” column (whose four companions are on the reverse of the sheet), Sierra draws a “Doric”-style doorway. He also included a drawing of an aqueduct, perhaps to demonstrate his practical skills. The work is made on a sheet of smooth European paper, drawn with ink. It measures 43.2 x 58.8 cm (17 x 23 inches). Bérchez, Joaquín. 1992. Arquitectura mexicana de los siglos XVII y XVIII. Mexico City: Azabache. Bérchez, Joaquín. 1999. 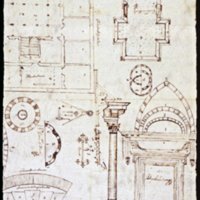 “Dibujos de albañilería, arquitectura,…” In Los siglos de oro en los virreinatos de America: 1550-1700. Pp. 284-286. Madrid: Sociedad Estatal para la Conmemoracion de los Centenarios de Felipe II y Carlos V.